Charles Pudrith, NIU assistant audiology professor, wants to find out if genetic variants explain susceptibility to acquired hearing loss and he needs your help – especially if you’re a musician. 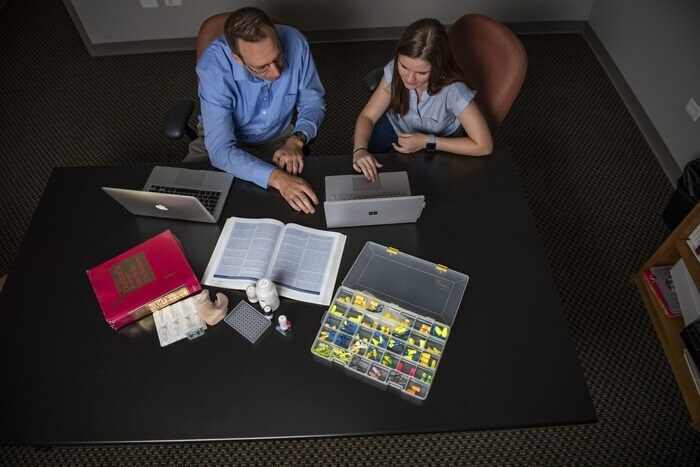 Charles Pudrith and student Elizabeth Pawlica work on hearing research. Pudrith is overseeing the new NIU Hearing Conservation Center, which has two components: service and research. The center is offering free hearing tests to all NIU students, faculty and staff, as well as collecting data for the research project. Any NIU student, faculty or staff member may set up an appointment for a 20-minute hearing test that includes answering a few demographic questions, a check for wax, a middle ear screening, and then a pure-tone test where participants press a button when they hear a beep. After the tests, which are conducted by NIU audiology students, the results are discussed. Hearing conservation efforts, like limiting noise exposure or a referral to a clinic for further testing could be some of the recommendations. Pudrith encourages musicians and music students in particular to get tested. “Early signs of hearing loss are hard to detect without a test. Musicians are particularly susceptible because their high noise exposure, plus their advanced listening skills hide the early warning signs,” Pudrith said. To support research, those between ages 18 and 25 years old can undergo an additional 20-minute test and receive $10 or a pair of musician’s ear buds. This test will gather research data. “We will use that data to look at advanced techniques that detect hearing loss early,” Pudrith said. “We’re trying to identify genetic variants that could explain susceptibility to acquired hearing loss, and getting an idea of how the biology really works. If you have hearing loss at early age, you may have one of these genetic variants,” Pudrith said. As well as providing a great asset to the university and the DeKalb communities, NIU students also benefit, said Sherrill Morris, chair of the NIU School of Allied Health and Communicative Disorders. Tests are conducted in 9 a.m. to 1 p.m., Wednesdays and Fridays, Wirtz Hall, Room 314. Walk-ins are welcome, but appointments are prioritized. To schedule a hearing test, or to participate in the research study, visit go.niu.edu/hearingconserve or call 815-753-6533 or email hcc@niu.edu.